Recipe by Lisa Keys, Good Grief Cook. 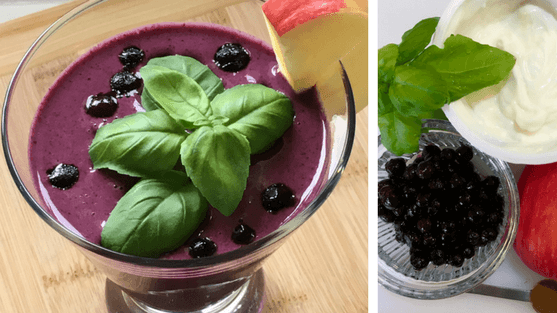 In high-powered blender combine blueberries, blueberry yogurt, apple, basil, honey and cinnamon until smooth. Measure out ½ cup and divide between two serving glasses. 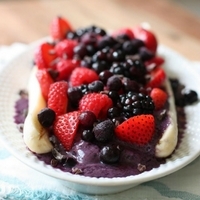 Add banana and plain yogurt to remaining mixture in blender; blend until smooth. Top off glasses evenly using just half of the blueberry-banana mixture. Add half of the coconut cream yogurt and the ice cubes to the remaining mixture in the blender; blend until smooth. Spoon or pipe remaining coconut cream yogurt on top. 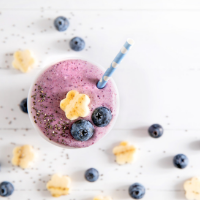 Sprinkle with wild blueberries. Garnish with basil sprig.